Chinadaily Forum › BBS › News Talk › China & World › Who Rule America? Who is Uncle Sam really? Believe it or not......, Good Old Uncle Sam actually belongs to jolly old England! thus ruled by Anglo-Brotherhood that originally sprung out of British Isles, as far as they are concerned. their population. Then the next step is colonising the whole wide world, over 30 nations altogether. essentially controlling pretty much the world's economy, for centuries up to this date. Alliance through U.S. military, Wall Street, and all that land-based resources coming out of pillaged lands. times over. Yes, that's it; you read it right, 500 times more than needed to wipe out all the living beings on this planet! future generations nuke bomb making materials, extremely rare minerals only left in the ground of that nation. In U.S., anyone who come here / are born here become Americans. Are they really? -1) American the landlord, 2) American the tenant and, 3) American the native. colonial empire and Anglo interests worldwide twice!]. Britain, Canada, Australia, New Zealand and in lesser extense, South Africa. of their land, from Oklahoma Texas to Gulf of Mexico and Alaska; yes, thats oil alone] for five centuries and counting. businesses that few want to ever associate with. 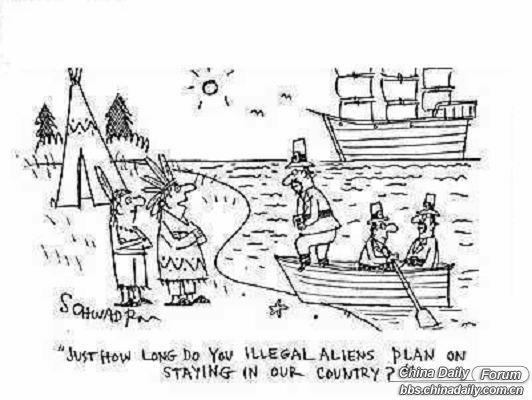 5 million native population centuries ago, while Europe herself had around 15-20million then]. indigenous they may be but, as somewhat forgotten and marginalized and American to this day. [*The Continent of North & South America is NOT a New World, as Europeans had falsely claimed. Indigenous native people of different tribes had been living on it for many many generations. Their forebears had persevered through thick and thin on their beloved land. Netanyahu received a standing ovation by CONgress after telling Obama to shove his ME peace proposal. Washington takes its orders from Tel Aviv via AIPAC. Ordinary Americans feel powerless, as the absolute power laid in the hands of establishment of Anglo-American masterminders. I think it's all about keeping up appearance; while America is promoting democracy world wide, the genuine democracy at home is in thin air. During the course of this long-running, class-action litigation, it has been documented that the United States owes Indian people more than $137 billion for mismanagement of trust accounts. That was established just by the documents that were presented. The original federal judge on this case was Royce Lamberth, who held at least three secretaries of the Interior in contempt for not producing thousands of additional documents. Also, during the course of this case, hundreds of relevant documents were found in the trash by Interior Department employees, who reported this to the court and to Interior Department officials. Those of us who own Indian land, heirs and the American public do not know the total amount owed to Indian people, because the government has refused to turn over all the documents ordered by the federal court. Lamberth was removed from the case; officials in the Bush administration argued that he was biased in favor of Indians. This has rarely happened in the history of U.S. jurisprudence. Lamberth was appointed by former President Ronald Reagan and is a Texas Republican. So basically, now, the U.S. government is saying that it has identified the thief of Indian royalties and resources as itself. It has allowed the thief to determine the value of the settlement and mostly has allowed the thief to keep what has been stolen. onto it long enough does it becomes yours. To add insult to injury, the government is clearing its conscience by paying back 2.48 percent of the so-far known value of what the United States stole in the first place. Paying $3.4 billion on a known debt of $137 billion is a national disgrace; this needs to be known by all Americans. Cobell should have at least held out until all the documents were presented or a final calculation of the debt was determined. but they kept only one. Bill Means is a board member of the International Indian Treaty Council. With the exception of what happened to the Indian Americans, so what? It's nobody's business that we anglo's fairly much control the world, and don't you think we earned it? We beat the enemies in 2 workd wars, aided nations rebuild, fed the world, manufactured for the world, created great scientific advances for the world, but, we can't do it all at once so we continue to try and make the world a better place. Those of you who hate us do so out of jealousy and lack of ability to have what we have. It's so simple, be creative, be innovative and do your best to educate your people. Rememeber that the bigger you get, the more people expect you to not mind your own business, merely because you're the biggest and most powerful. When this happens, you're damned if you do, and damned if you don't so make your choices well. Then, when at the height of your power another giant falls and another begins to rise in it's place. You're involved in a couple of wars you shouldn't be but it's not so easy to disengage. The wars cost a fortune that you don't have, economic problems at home are now prioritym people are losinjg rather than gaining, education is at an all time low and the world continues to nip at your heels for help, for being the richest and most powerful. The world, even that rising giant wants you to do things for the world and you genuinely try, but whatever you do is wrong and all the while, these other non-anglo nations keep nipping at your heels. You're still top dog, but one day, all these little nips at the heels will cause you to turn around and bite the head of the nippers. One day, that rising giant will know how the old giant felt as the litte dogs nip at it's heels.